July 16, 2014 – Commander Steve Swanson and his crewmates welcomed more than a ton and a half of science, supplies and spacewalking equipment to the International Space Station Wednesday. 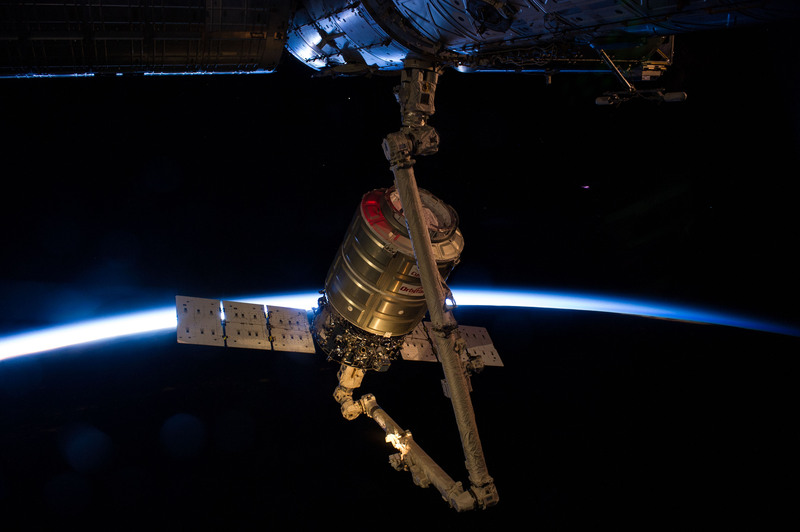 The supplies were delivered by Orbital Sciences’ Cygnus cargo spacecraft. Cygnus was grappled by Swanson, with assistance from Flight Engineer Alexander Gerst, at 6:36 a.m. Swanson controlled the 57-foot Canadarm 2 from a robotics workstation inside the ISS cupola as the cargo capsule flew within 32 feet of the complex. With Cygnus securely in the grasp of the Canadarm 2 robotic arm, the robotics officer at Mission Control in Houston remotely operated the arm to guide the cargo craft to its position. Flight Engineer Reid Wiseman monitored the Common Berthing Mechanism operations for first and second stage capture of the cargo ship, assuring that the vehicle was securely attached to the station with a hard mate. Second stage capture was completed at 8:53 a.m. EDT. Orbital Sciences named this newest Cygnus vehicle the SS Janice Voss in honor of the NASA astronaut and Orbital employee who died of breast cancer in February 2012. Swanson paid also tribute to his former colleague after the successful grapple. After Wiseman removed the Centerline Berthing Camera System that provided the teams with a view of berthing operations through the hatch window, he pressurized the vestibule between Harmony and the newly arrived cargo craft and conducted a leak check. Once that was complete, Swanson and Gerst opened the hatch to the vestibule and outfitted the area for the opening of Cygnus’ hatch around 6 a.m. Thursday. This was Orbital’s second cargo delivery flight to the ISS, operating under NASA’s Commercial Resupply Services contract. Orbital will fly at least eight cargo missions to the space station through 2016, but has no current plans to fly crew. The Orbital-2 mission delivered almost 3,300 pounds of supplies to the station to expand the research capability of the Expedition 40 crew. Among the research investigations aboard Cygnus are a flock of Earth-imaging nanosatellites, hardware to enable a trio of free-flying robots to perform 3-D mapping inside the station and a host of student experiments. Orbital’s Cygnus was launched on the company’s Antares rocket at 12:52 p.m. EDT Sunday from the Mid-Atlantic Regional Spaceport Pad OA at NASA’s Wallops Flight Facility in Virginia. Cygnus will remain attached to Harmony until a planned unberthing August 15. After it departs the orbital laboratory, carrying about 3,000 pounds of trash with it, the spacecraft will conduct additional tests for future missions to the space station before a destructive re-entry in Earth’s atmosphere.